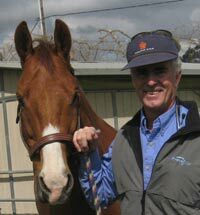 Gary Amaral is a Mobile Equine Veterinarian in Bonita California serving the communities of: Alpine, Bonita, Campo, Del Mar, Descanso, Dulzura, El Cajon, Escondido, Imperial Beach, Jamul, Lakeside, Pine Valley, Poway, Rancho Santa Fe, Santee, Ramona. Gary is happy to answer your questions. We look forward to helping you keep your horse happy and healthy. We hope you will enjoy using our web services, but a phone call is your best resource.